The Terrace Room features a fantastic view, food resembling the kind you'd get on a cruise ship, and service slow enough to drive you mad. The food isn't amazing, but the view is. Hours: Mon.-Fri., 11 a.m.-2 p.m., Sat.-Sun., 10 a.m.-2:45 p.m.; Mon.-Wed., 5 p.m.-8 p.m. Thurs.-Fri., 5 p.m.-9:30 p.m. The first rule of finding a restaurant with great food and an amazing view is there are no restaurants with great food and an amazing view. That's the conventional wisdom in the Bay Area, anyway: Why bother fussing with the recipes when you can coast along on the back of prime real estate? 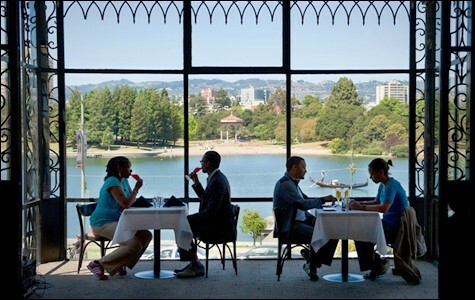 So I respect the fact that chef Devon Boisen changes the menu at The Terrace Room every day, the restaurant's gorgeous panoramic views of Lake Merritt and the Oakland skyline notwithstanding. And I've only heard rave reviews for his "One Fermented Evening" alcohol-paired dinners, a series that Boisen created back in his days as a chef in the McCormick & Schmick's chain of seafood restaurants. Still, I had modest expectations for my meal at The Terrace Room. 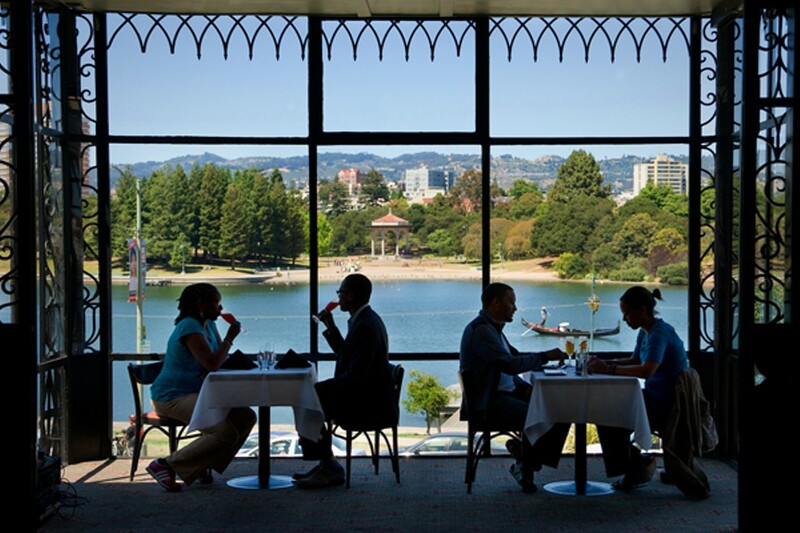 Oddly enough, in spite of the five-star vista, the restaurant is still something of a well-kept secret — partly because of its location on the first floor of the Lake Merritt Hotel, a 1920s Art Deco hotel-apartment that's now best known for housing an AgeSong senior facility. Even though Boisen stresses that he's running a restaurant that's open to the public (a "big-boy restaurant," as he puts it), the fact remains that early on a recent Monday evening, nearly every diner looked to be upwards of eighty years old. All the residents are on a meal plan, it turns out. The dining room itself was cavernous and eerily quiet. There were white linens, but the sparseness of the setup made it feel more cafeteria than fine-dining. Only four or five tables were occupied. My wife mistook the tinkly Muzak coming through the speakers for someone's cell phone ringtone. Meanwhile, the aged were gathered variously. Some had dressed up for the occasion; others had brought their own seat cushions. One distressed-looking elderly gentleman kept holding his head in his hands — whether out of fatigue or confusion, I couldn't tell. Eventually, the server brought him a giant burger, which he dove into with much aplomb. But about that view: On a clear summer evening, when the geese are doing their leisurely glide across the water and the setting sun is reflected on the surface of the lake, it doesn't get much better than that. But in spite of the chef's earnest efforts, the food at The Terrace Room doesn't always live up to the scenery. Since he came on a year ago, Boisen has revamped the menu with the intention of making the food more accessible and less expensive. Still, the options read like what you might encounter on a cruise ship: a steak, a fish, a pasta. A healthy sprinkling of regional and international accents. Annoyingly, every dish with olive oil is listed by brand name: "Amphora Nueva Arbosana Sauce." There are also items on the menu that are straight out of a time warp. My favorite dish was a grilled-chicken Waldorf salad, of all things — a classic combo of lettuce, mayonnaise, apples, grapes, dried cranberries, and walnuts. Boisen's mayo-based dressing was light and refreshing, the chicken was nicely grilled, and I liked how the walnuts had been crushed into crunchy toasted bits. In general, however, it could not be said that Boisen's cooking is characterized by subtlety and restraint. A cheeseburger with guacamole and a fried egg and white truffle oil and bacon? It turned out to be a tasty enough burger, even if it was a bit of a grease bomb. The accompanying French fries looked and tasted like straight-up McDonald's, which to me wasn't a bad thing, assuming no unholy chemical agents were applied. On the other hand, the grilled rib-eye steak I ordered was god-awful — unevenly cooked and more or less unseasoned. The coup de grâce was a mushroom-and-red-wine-peppercorn sauce. Translation: On top of my steak were sour-tasting, unappealingly purple-hued mushrooms and about a hundred shriveled-up whole black peppercorns that set me to coughing when I tried eating one, and which infested my entire plate after I brushed them off — little peppery booby traps scattered throughout my mashed potatoes and broccoli di ciccio. Just a bit of editing and the food at The Terrace Room could be so much better. During a subsequent brunch visit, I ordered Boisen's take on fried chicken and waffles. The Belgian-style waffles were fine, if not quite airy and transcendent, but they had been drenched in so much melted butter that they'd lost all their crispiness. The chicken itself was excellent — a boneless breast, but coated with a flavorful and super-crisp batter. Fortunately, I'd been forewarned by online reviews: I asked for the "bourbon bacon gravy" on the side. If you're like me and prefer your crunchy foods to stay crunchy, the very notion of slathering gravy on top is anathema. Besides, I took one taste of the stuff — boozy and excessively sweet — and never touched it again. A final note: I'm pretty low-key when it comes to the level of attention I expect when eating out. And I appreciated how good the staff was with their "regulars" (the old folks who dine there every day) — a familiar hand on the shoulder, a little inside joke. Nevertheless, the service at The Terrace Room seemed almost aggressive in its slowness. We waited fifteen minutes to be offered water. Our first appetizer didn't come out until forty minutes after we'd been seated. And after we'd finished our meal, we were left hanging for another twenty minutes, as our waiter studiously avoided eye contact while I tried in vain to get his attention. That nixed our dessert plans. We found the weekend brunch service to be a little bit more efficient, so that might be your best bet if you're thinking about giving The Terrace Room a try. Grab a seat by the window, order a $7 bottomless mimosa, and remember: Whatever the sauce happens to be, you should probably consider ordering it on the side.